The story behind our Christmas tree ornaments is one of my favorite things about the holiday season. Hanging each one and explaining to my children where I got mine or where they got theirs is something I look forward to each year. It’s always fun to make ornaments, too, because they enjoy seeing things they’ve made over the years. 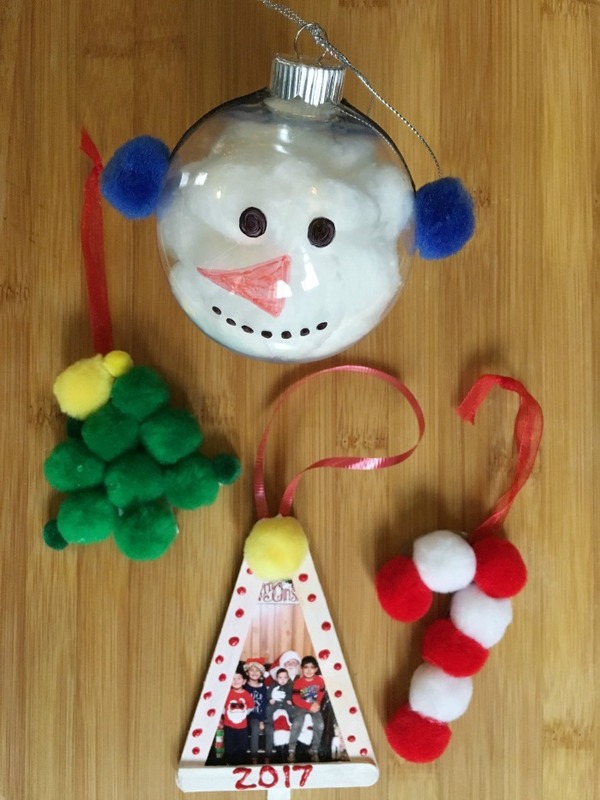 Each year I post about homemade tree ornaments; check out some from year’s past like the Santa Hand and Reindeer Hand Ornaments or the Cookie Cutter Ornaments. You’ll love this year’s creations because they’re easy and a toddler or elementary aged child can do them. Choose from your cookie cutters which shape you want to do. Next, trace the shape from the cookie cutter on the piece of cardboard. Cut the shape out. Parents, you’ll have to do this part for little kids. Using your hole punch, punch a hole at the top of the ornament and tie the ribbon for hanging. Then, have your child pick which pom poms they’ll use and glue them to the cardboard cutout. Let glue dry before hanging. Start by pulling apart the cotton balls a bit so they can be pushed through the small hole of the ornament. 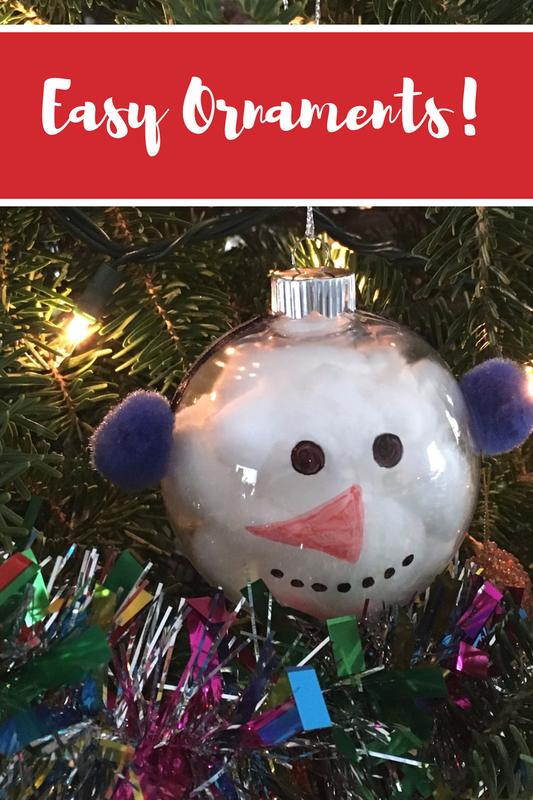 Once ornament is filled to your liking with cotton balls, place the ornaments cap back on and draw your snowman’s face. After that, glue ribbon around the top of snowman’s head for the headband part of the ear muffs. Then, glue the pom poms on the side of the snowman’s head for the ear muffs. ***The ear muffs can be omitted if you’d like, it’s cute without it, too! Glue the shape of your photo onto card stock for extra support. Paint your popsicle sticks to the color of your choosing. I chose white because I wanted it to stand out against the green tree. 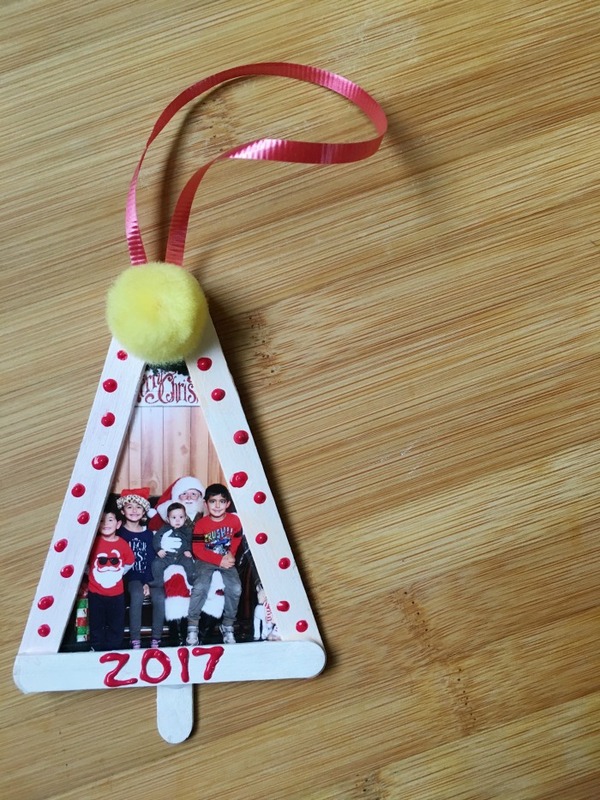 Before you glue the pieces together to form a tree, mock the shape of the tree over your photo to see where you need to cut the photo and card stock. Once it’s situated, glue your popsicle sticks to form a tree. You’ll notice the bottom of the tree is a bit shorter in length. When you cut a small piece off for the shorter part, use it for the stem. Glue it to the back of the ornament. 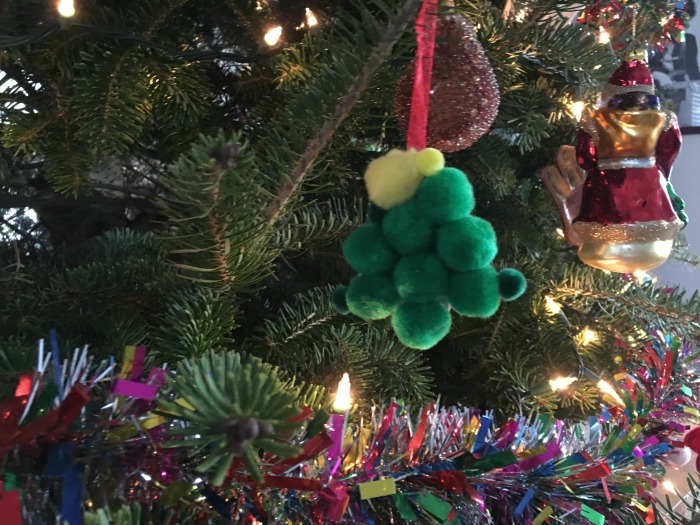 When tree is assembled, embellish it with puffy paint or ribbon or paint. Once ornament is dry, tape or glue ribbon to the back for hanging.